As Well As They Used To? WHAT IF You Can Have The Ultimate System That Allows YOU To Offer Tons Of Offers Doubling Your Profits Through A Single Download Link?? not necessarily your own products! Control how long each offer last. Don't Wait Another Moment! You Can Triple Your Online Profits By Leveraging On A Single Download Link! Do you think grocery stores lined up the most frequently purchased items at the back of the store for no apparent reason? Do you think the checkout which was surrounded with displays of sweets and magazines leaving you browsing through them, for the next 5-7 minutes was pure accidental? The truth is, these stores rely on the fact that most buyers will buy more than they intended to, buy much more than what they have on their list and be seduced into buying sale items because they're on sale. These same grocery stores have invested millions of dollars in total on researching buying triggers like these to boost profits. It's this form of marketing that works like magic on almost everyone. ..you can entice your buyers into buying more products before downloading. Why not? If you can give them the opportunity to browse through other products on special offers, and empowering them with the controls to pause, repeat or skip the https://www.tradebit.com'll be an awesome deal. But the setback (used to be), there isn't any **simple software** in the market that allows you to do that! So What Is Interstitial Advertising? Interstitial implies "in between" which is also called transitional, represents a process of putting whole messages between the current and destination page. Since the internet is such an active place, people have found methods to deal with over-stimulation. One way of getting by is called receptive input filtering. This means that our wits will learn to filter the immense bulk of the contents coming at them. We the viewers, rapidly learn at some level to tell apart banner advertisements or anything that appears similar to a banner ad. We separate out most of the irrelevant interference but we also filter out a lot of the valuable messages. Interstitial ads, like TV advertisements make viewers a captive of the message. Regular interstitials last 10 secs or less. Monitor how many times your download links were clicked. ...Plus, So Much More Than Can Be Added Here! Do you know up till today there are several reputable (well-known) companies making several millions of dollars monthly by dropping cookies into web-surfers browser? How About Bum Marketing On Steroids? Let's say you love writing articles (even if you don't you can pay someone to write for cheaps), you submit one of your articles to an article directory. Now this article leads to a simple web page lined with links managed by the Interstitial Links Manager. They click your links to download your free products, or to view your offers. Those links looks like normal short links but the twist is that each link drops a different set of cookies that credits your affiliate account for every item sold. All this is possible because the Interstitial Links Manager is packed with a feature that allows you to add unlimited number of cookies to a single link stealthily. As compared to other cookie stuffing script which only does what it says, ILM allows you to advertise your offer and stuff a cookie with every single offer while sending your visitors to a free download all at the same time. Now isn't that some powerful feature? I know it may sound a bit devious and if you don't like this feature or not tempted to use it at least once, then you can skip this option and the intestitial links manager is still ahead of any other link managers! Plus installation and operating is a cynch for non-techies! ..And How About The Interstitial Links Manager Being A Short URL Manager? Are you tired of promoting site after site as an affiliate, but in the end, you always feel like youve been cheated? Do you wish that there was a way that you could take your current links and transform them into more professional-looking links, attract more visitors, and explode your commission payouts with less hassle and work on your end to track and keep up with everything? Or have you ever said to yourself, There has to be a better way? * Allows you to manage all of your affiliate links across all of your domains from one easy to manage control panel! If any of these meets your needs, then I want you to know that I have a treat for you, because in a minute, youre going to learn about a sure-proofed affiliate and link tracking software that can solve all of your problems, make your life as an affiliate 100 easier, and put you on the road to prosperity all at the same time. If youre a veteran or even a newbie to affiliate marketing, Im sure you know that it can be challenging, what's more of a challenge is trying to ward off those who try to hijack your commissions by bypassing your link and replacing it with their own. Some companies have measures in place to protect against this, but many of them dont, so its best for you as an affiliate to take matters into your own hands and protect yourself. Some have tried cloaking. The problem, however, with cloaking is that in most cases, theres no tracking feature for you to keep up with your sales. And in order to do so, youll have to add another piece of software to accomplish this, which really is a pain to deal with. In addition, most affiliates, maybe even you, traditionally sign up to multiple affiliate programs and keeping up with all of your affiliate links, user names, login information and passwords to track and check your clicks and sales can be overwhelming and require that you use several different pieces of software to keep up with everything. But after today, you can kiss those days goodbye, because with this new, tested and proven-to-work affiliate and link tracking software, youll be able to eliminate those long, ugly links and instead, have a more professional-looking solution that entices people to click on your link and buy. So What Is The Interstitial Links Manager Again? 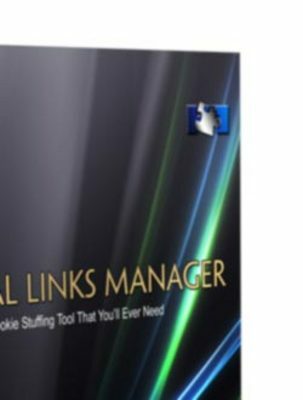 It's a Short Link Manager, a Multi Offer System, a Link Cloaker and a Blackhat Cookie Stuffer all Rolled Into One Simple To Operate Yet POWERFUL System!! Just A Few Reasons Why You Should Start Using The Interstitial Links Manager RIGHT NOW! Total control over each one and single links. One simple panel to access all of your auctions. If you had to hire a programmer to create this system for you, you could spend upwards of $1200 to $1500 dollars to have this put together... But, I'm not going to even come close to that price! But like all great things, the end product turns out to be so amazing that it can be applied to other tasks and other industries as well. And what we have right now is just the tip of the iceberg. Own this magnificent solution today and conquer new grounds with the power it'll give you!